It was the Boys & Girls Clubs of Metro Denver’s lucky day, seven years ago, when Larry Mueller was invited to play in the Jack A. Vickers Invitational at Castle Pines Golf Club, a tournament hosted by Hall of Fame quarterback John Elway. He was so impressed with what he learned about the organization that gives 2,000 Denver-area kids per day a chance to participate in programs that help them gain self-confidence, set goals and shape a path to success that he turned right around and established another high-profile fundraiser for it: Flight to Luxury. 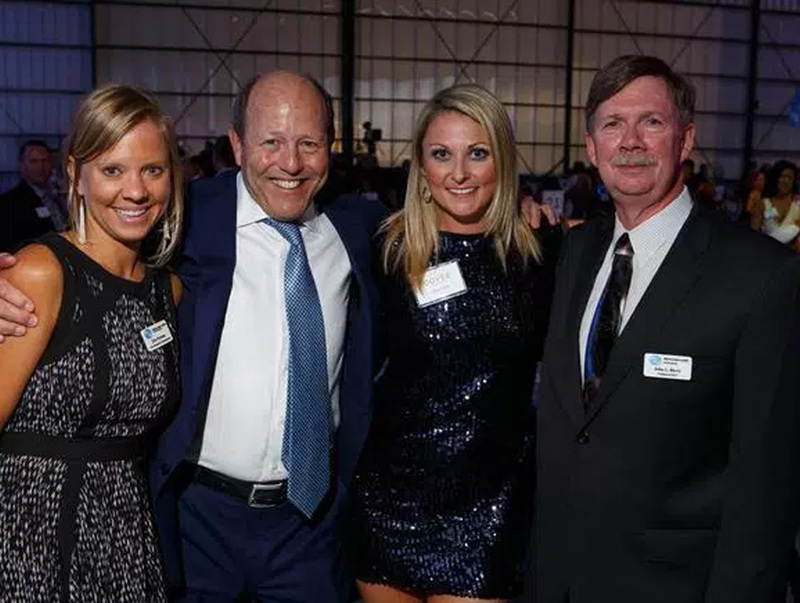 From 200 guests and a $50,000 profit in Year One, Flight to Luxury has become an event so grand that it takes two private hangars — Signature Flight Support and XJet, both at Centennial Airport — to accommodate its many elements. The 2015 edition had 1,000 guests and income that will exceed $1 million. Guests entered the party area on a red carpet path lined with exotic automobiles and private jets. A two-hour silent auction social gave everyone plenty of time to sample gourmet nibbles such as steak tartare from Bistro Vendome and lobster sushi from Oceanaire and sip champagne poured by an aerialist suspended from the ceiling. Then, with the Montbello High School drum line leading the way, guests proceeded to a seating area where master of ceremonies Rich “G-Man” Goins from 99.5 The Mountain introduced a fashion show, produced by Carol Kaye and styled by Betsy Marr, that featured designs from Mondo Guerra and Dennis Basso, as well as selections from Gracie’s, Swim ‘n Sport, Andrisen Morton and Calypso St. Barth. Mueller and his wife, Mary Kay, along with Boys & Girls Clubs CEO John Barry were on hand to welcome such VIP guests as Chauncey Billups, who retired in 2014 after 17 seasons in the National Basketball Association, and his wife, Piper; George and Carol Solich, whose Solich Fund was a $50,000 Diamond Sponsor; fellow Diamond Sponsor Damian Guillot, the owner of Aspen Art Gallery; Dana Davis, interim executive director of the Children’s Diabetes Foundation, with boyfriend Shane Hendryson; Lydell Peterson from the Six13 Marketing Group; Oakwood Homes CEO Pat Hamill; and Navin Dimond, founder, president and CEO of the Stonebridge Companies, and his wife, Rita.